In a world of mass produced, Pinterest perfect weddings, own your vision with finely crafted, totally unexpected flowers. If you love this Oregon landscape and have a gorgeous vision for an off the beaten path, true to nature inspired wedding, I got you. Planning wedding flowers can feel really complicated and intimidating. That’s why I’ve developed an approach to wedding flowers that will empower you to do things your own way (no more being tied to pictures you’ve seen a thousand times, or being limited to a two color prom palette!) and, dare I say, have fun doing it! Your vision + my background in design, events, and knowledge of horticulture = a thoughtful, creative, one of a kind plan for executing stunning, totally you wedding flowers. Answer a few questions (ie tell me anything about yourself, your s.o., what you love to do in your spare time, your favorite t.v. shows... anything you care about that makes you you!) and hit "submit"! I'll get back to you within 72 hours so we can get this thing started! My 3 step design process is designed to keep your part simple and stress free, and allows me to design and plan on a timeline that works for our unique collaboration. 2. Have a quick chat! After I get your email, we'll schedule a quick phone call so I can REALLY get the scoop on your wedding vision and put together a quote. It's low key, fun, no pressure, and a great way to see if we're the right fit for each other! 3. Grab coffee & get started! Meeting in person is essential. It's not just about banging out some details. I care so much about each couple carefully select every year - your wedding means so much to me. It's my livelihood, and my passion! I want to get to know you, anything and everything you have in your heart about your wedding. And I want to make sure we use this time to collaborate on curating the details and dreaming up the big stuff! "Alli was an absolute dream to work with! I told her the vision and she made it come to life with her incredible design for the florals and her amazing attention to detail. 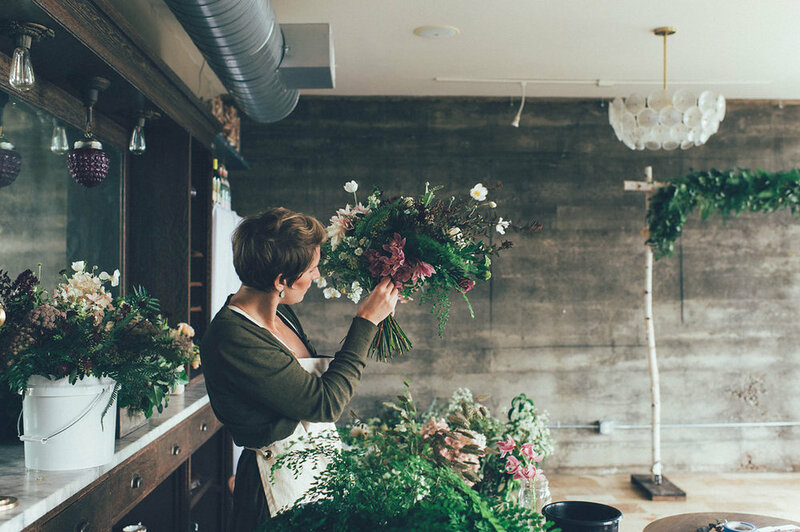 She truly went above and beyond"
You're pretty organized & creative, so why hire a floral designer? Back to details: you don't want your mom and friends sourcing flowers, making centerpieces and realizing corsages are harder than they thought the day before your wedding! You want them relaxing with a glass of champagne , and making memories with you. Having an adventure instead of an event? I have a few spots each year for elopements. Are you a fellow event pro?